What does the last of the housewives do? I may have lost the knack of whiling away a sunny day in the hammock with a book and chocolate nicked from the kids. I got into the trackies this morning, no problem. But the husband broke the hammock yesterday, aided and abetted by the larger children, and there is SO much washing to do. Not only that, but there are jam jars to fill (lemon butter again) and a couple of little nieces coming to stay the night. I do have gingernuts, brownies, caramel icecream and an egg hunt planned for later in the afternoon, but I’ve been hanging out to have a crack at marshmallows. So after putting on a bleach wash full of paint stained shirts, sun hats and sports gear to prepare for the coming school term, I assembled the ingredients. This recipe does actually require a bit of concentration, not to mention heavy machinery. You can’t do these with a whisk. I think the best order to do it in is this. Put two tablespoons of powdered gelatine in a metal bowl containing 190 ml of water. Then put another 190 ml of water in a heavy saucepan with 500 grams white sugar and a tablespoon of liquid glucose and start heating it up. I’d use a sugar thermometer for this, due to the concentration needed on other things. 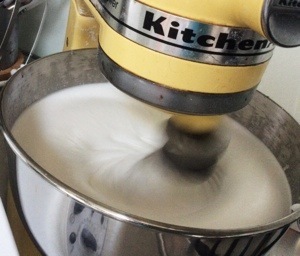 Put two egg whites in the bowl of your KitchenAid and get that whisking at a fairly brisk pace. OK, got all that? Gelatine soaking, sugar coming to the boil, egg whites whipping. You only want the sugar syrup to get to hard ball stage, about 125 degrees C, so when it’s approaching that sit the gelatine bowl in some hot water and gently stir it until it has dissolved, trying to ignore the ghostly whiff of departed horse it exudes. When the sugar has reached 125 degrees, tip in the gelatine and mix it in. Turn the heat off. By this stage your egg whites should have reached stiff peak stage. Keep the KitchenAid going while you pour the sugar solution steadily in, ignoring the wobbles that will develop in your elbow. 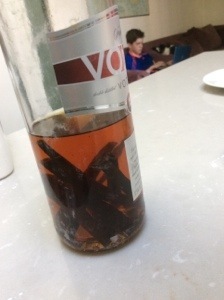 Chuck in a teaspoon of vanilla essence, I make my own. Saves a fortune, I go through a lot of it. Then you leave the whipping going for ages, about ten minutes. Meanwhile mix together half a cup of cornflour with half a cup of icing sugar. Line a couple of baking trays with baking paper, then dust them with some of the cornflour mix. 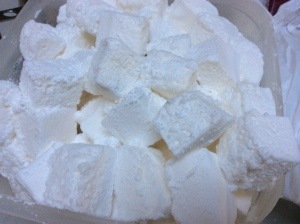 When your marshmallow mix is finally getting thick and glossy, pour it into the trays. Then spend a couple of hours going about your business, doing more washing, finding what the ants are eating in the Horror’s room, trying to think of a good one hour activity to cover Planet Earth in the Stage 3 science curriculum, ignoring the Moose’s attempts to insert Axis of Awesome’s Skeleton Man into my brain in earworm form. Sprinkle more cornflour mix onto your benchtop, turn the marshmallow out onto the counter and gently peel the baking paper off, quietly cursing yourself that you didn’t put more cornflour mix on it. 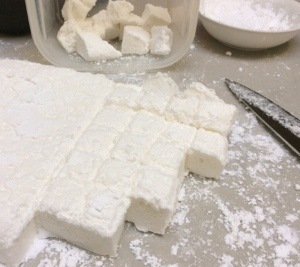 Cut it into squares with a sharp knife and dip each square into the remaining cornflour mix. Even if I do say so myself, they’re really good. Fluffy, not sticky. One could have dipped them in toasted coconut, a lá Darrel Lea, perhaps next time. Relatively labour intensive, but it does make a lot, and I wouldn’t mind going a bit crazy with the flavours, but they’d have to be in essence form. I could go lavender, rose and violet, the Paris effect hasn’t worn off yet. But I’d have to visit the Essential Ingredient first. The sacrifices I make. Should I go to Costco?